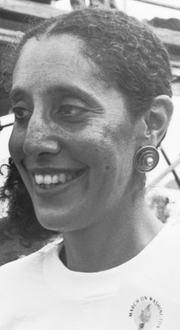 "Lani Guinier at the 30th anniversary of the Poor People's March on Washington D.C." by Wikipedia user Smalagodi. Lani Guinier has 2 media appearances. Lani Guinier discusses Tyranny of the Majority : Fundamental Fairness in Representative Democracy. Lani Guinier's book The Tyranny of the Meritocracy was available from LibraryThing Early Reviewers. Lani Guinier is currently considered a "single author." If one or more works are by a distinct, homonymous authors, go ahead and split the author. Lani Guinier is composed of 1 name.